Be sure to read all the way to the bottom for a sweepstakes. Sometimes I forget this is a blog. I get caught up in writing about travel, film and lifestyle and forget to write about myself. So when Brookside approached me to write a personal piece sponsored by their new BROOKSIDE Yogurt Flavored Fruit & Nut Bars, I saw a great opportunity to share some of the expected and more unexpected stuff about me. We were all smiles on our rickshaw to the ferry! I can’t tell you how many, actually 100% of the people I speak to, tell me what an amazing mom I am. They rant and rave about how awesome it is that I take my son around the world, that he gets to see history and culture front and center. While all this is true and very expected as I am an international travel, lifestyle and film blogger, I can’t help but feel like a bad mom…more than you may think. It may come very unexpected to you that I say this. I completely get that. But the truth of the matter is that running a brand which is home to upwards of 70k fans is a lot of work. I am a full-time blogger and brand influencer. And moreover, a single mom. All my bills are mine alone, all my work is mine alone. I have a dedicated staff of writers and one exceptional associate editor (who I would literally crawl into a hole and die without), but still I am swamped. The amount of pressure on me to make deadlines, apply for sponsorships and create content is, well…I can’t even describe how much it is. Throw in long flights, jet lag and those times I have to be away from my son and you have one stressed mama. I spend weeks away from home only to return to a few weeks at home with so many deadlines your head would spin. This lands me in my office more than in an epic battle of Candy Land. And while I sit here, pounding away at my keyboard, my son is getting bigger by the second. Sure I get to travel with him, home school him and spend time with him away from home… but it’s nearly impossible for me to spend time with him when it’s time to work from home. I carry an incredible amount of guilt over this. I keep telling myself I’ll figure it out, that I’ll get better at time management but truthfully, my email fills up faster than you can say, “emails”. And when your income is found in your emails…well you do the math. It’s hard. I’m missing my son and he’s right here. If ever anyone needed a clone, it’s me. We travel a lot and that brings us together. Despite the absence of quality time in the home, we get a lot of it on the road. One thing I can’t stand is airport food. Not only is it expensive, but it’s generally unhealthy. For long haul flights we always have a meal on the flight, but that doesn’t always cut it when you have a growing boy. I like to pack small healthy snacks for my kiddo, something with substance that provides good energy. Hershey’s sent me samples of their new Brookside Fruit & Nut Bars and I think I’m in love. You have to try these. You’re going to flip over them as much as I have. The Hershey’s Brookside Fruit & Nut Bars have a variety of interesting ingredients and fruit flavors like; fig, vanilla, mango, pineapple, cranberry, citrus, blueberry, acai, chocolate and many more. I absolutely love the flavors and when paired with chocolate or yogurt flavored coatings it gives a nice portion of sweetness. I love that it satisfies both. A completely unexpected treat for me when I expected a typical fruit & nut bar. 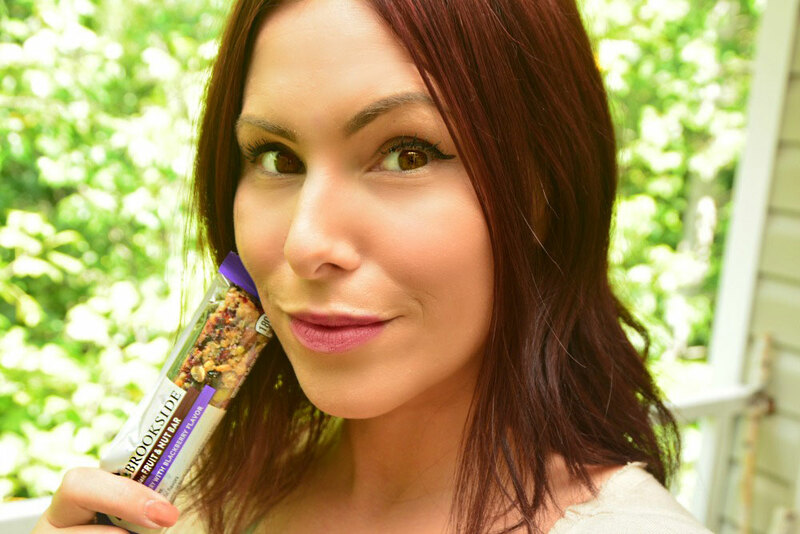 I tried six different Brookside Fruit & Nut Bars: Official favorite is Blueberry and Acai OMG! The new Brookside Yogurt Flavored Fruit & Nut Bars are made with real fruit with natural flavors, nuts, and seeds and accented with a tasty yogurt-flavored cream. They are gluten-free, non-GMO bars that contain no artificial flavors. Check out all the details of their ingredients on the BROOKSIDE website. You can #ShareYourBROOKSIDE too by revealing something expected and unexpected about your personality. If you #ShareYourBROOKSIDE, you could win up to $1,000 toward a unique and fun adventure! Share your unexpected side on Twitter or Instagram using #ShareYourBROOKSIDE and #SweepsEntry! You can also enter by commenting on one of the sweepstakes posts on the Brookside Facebook page. Be sure to check out the Full sweepstakes rules.